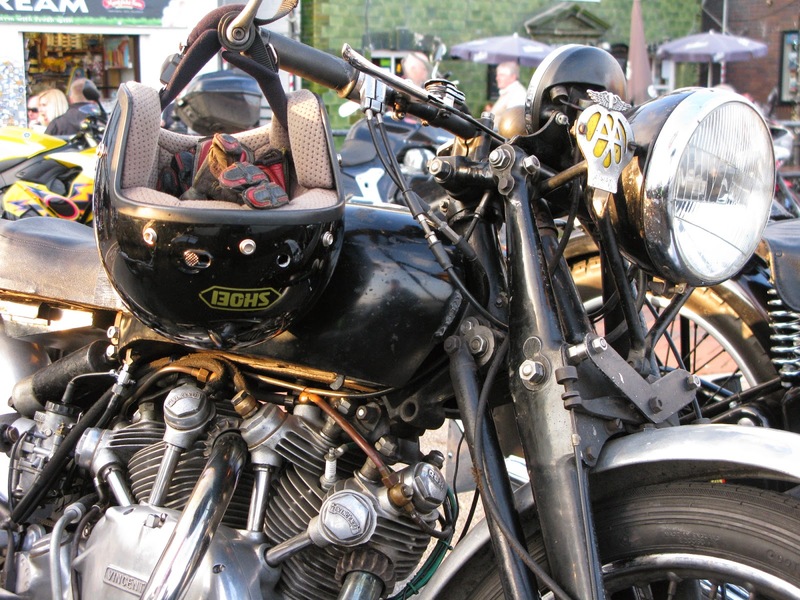 A treat to see a Vincent Rapide in oily rag condition like this. 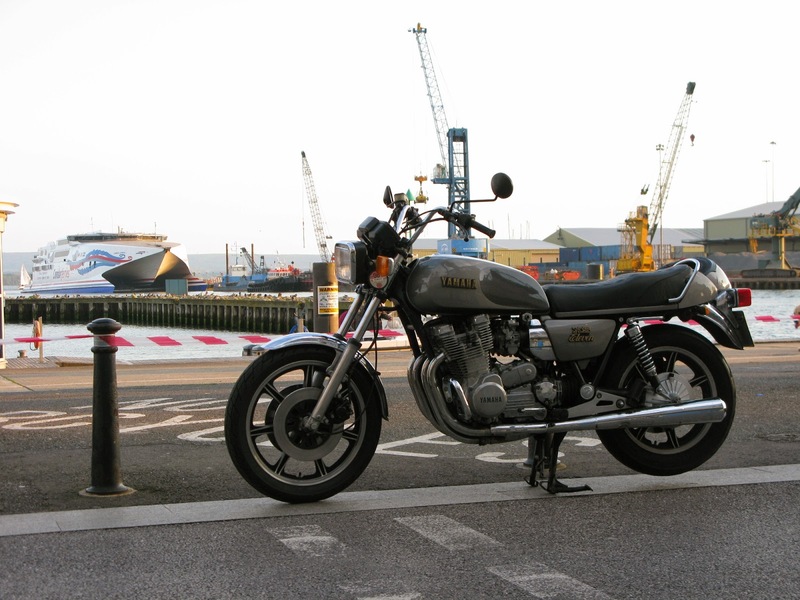 and in fine condition, Yamaha XS1100. BSA A65 Hornet desert racer. 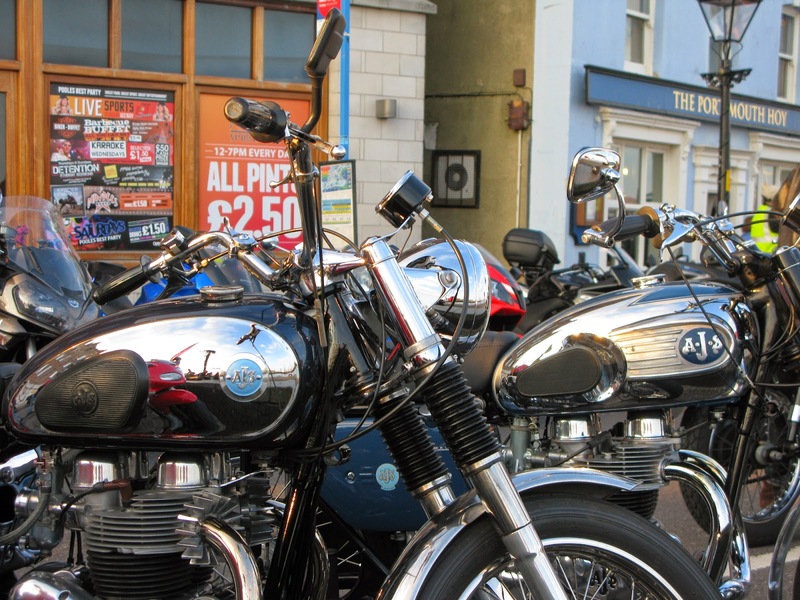 A lot of chrome on this smart pair of AJS twins. 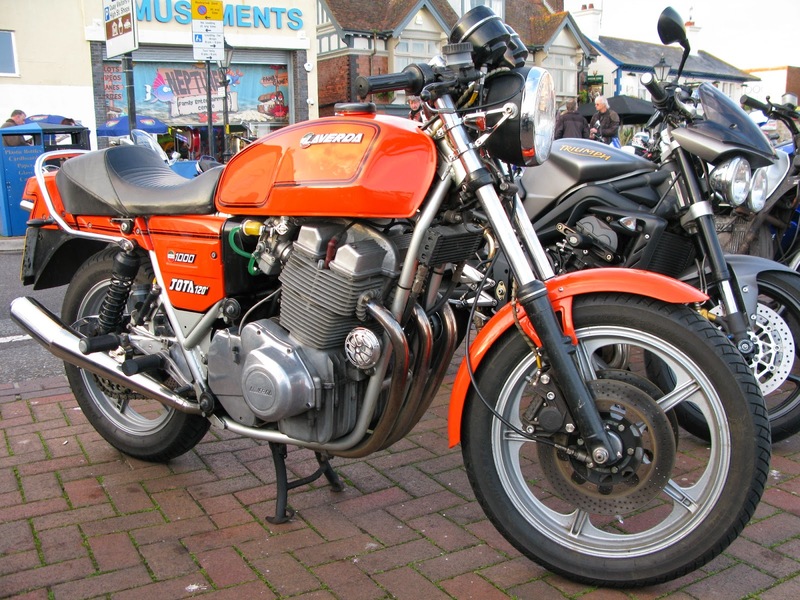 Laverda Jota in fine condition. This hybrid concept scooter from the world's largest bike manufacturer, Hero, was recently unveiled at the Delhi Motor Show. Absolutely brilliant. The RNT has a 150cc single cylinder diesel motor, is liquid cooled, has the option of a turbo charger and puts out 13hp with 26 lb.ft torque. 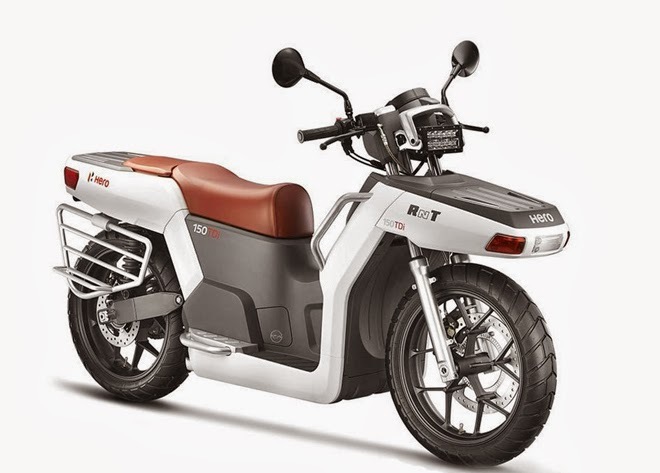 A viable diesel two wheeler is already a good thing but the Hero goes one better as it has an electric motor in the front hub so can be used electric only for suburban riding or in two wheel drive mode when the going gets rough. If it all sounds a bit unnecessary that's because you don't live in India and don't use a two wheeler daily to carry loads and your family (and sometimes both at the same time) on rough roads in poor conditions. Styling may not be to everyone's taste but it is utilitarian and to me looks right with echoes of the Honda Zoomer / Ruckus and the snowflake cast wheels top it off nicely. It could make a cracking adventure bike alternative as long as speed is not your bag, chances are it will go places BMW GS riders can only dream of. Let's hope it makes production. Here's the range of Villiers powered Sun lightweights for 1952. Not much information available about Suns on the web. 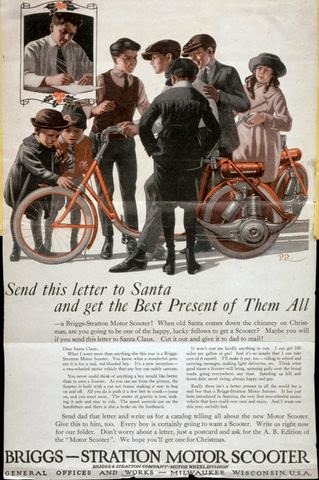 They started off with bicycles components in 1885, moved on to complete cycles by 1906 and then extended to motorcycles in 1911 or 12. Sun was eventually absorbed by Raleigh in 1960. 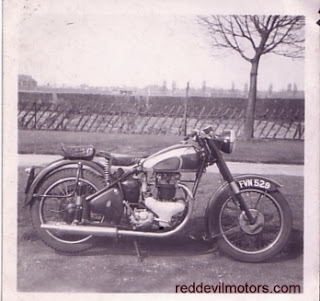 Sun motorcycles were always seen as being of quality and had a certain individuality in the design even if they were producing lightweights with bought-in engines. 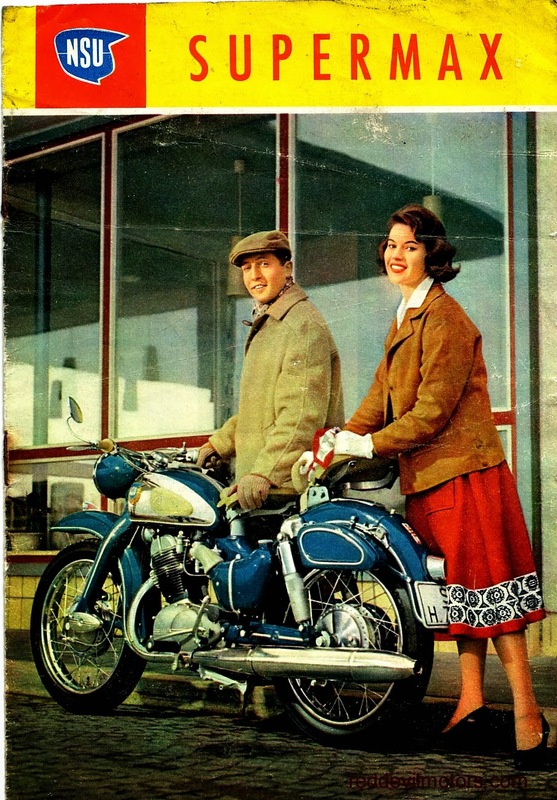 1952 Sun Motorcycles brochure front cover. 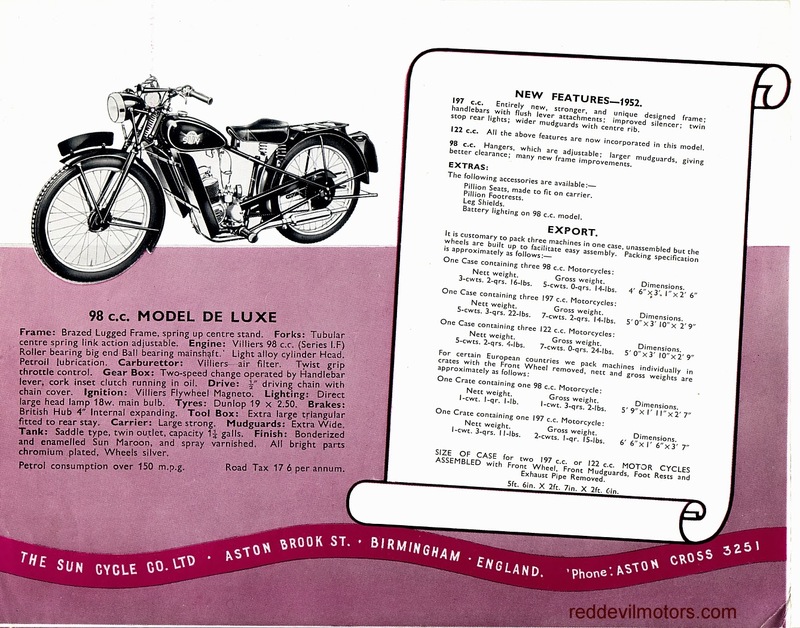 1952 Sun Motorcycles brochure centre spread pt 1. 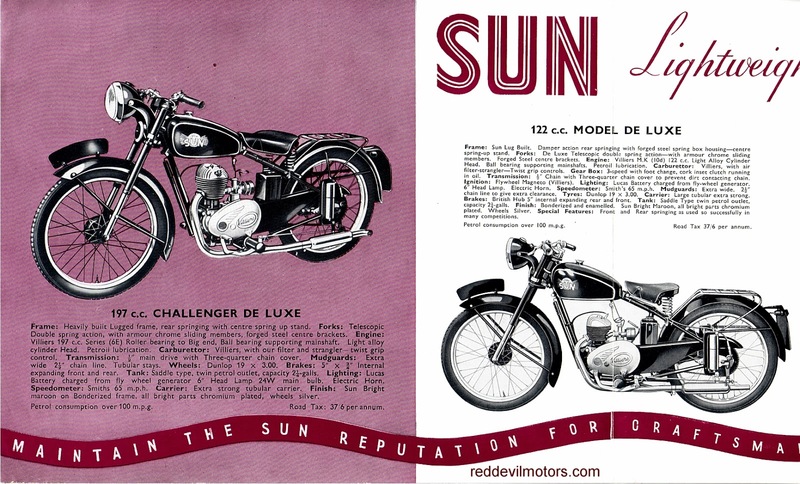 1952 Sun Motorcycles brochure centre spread pt 2. 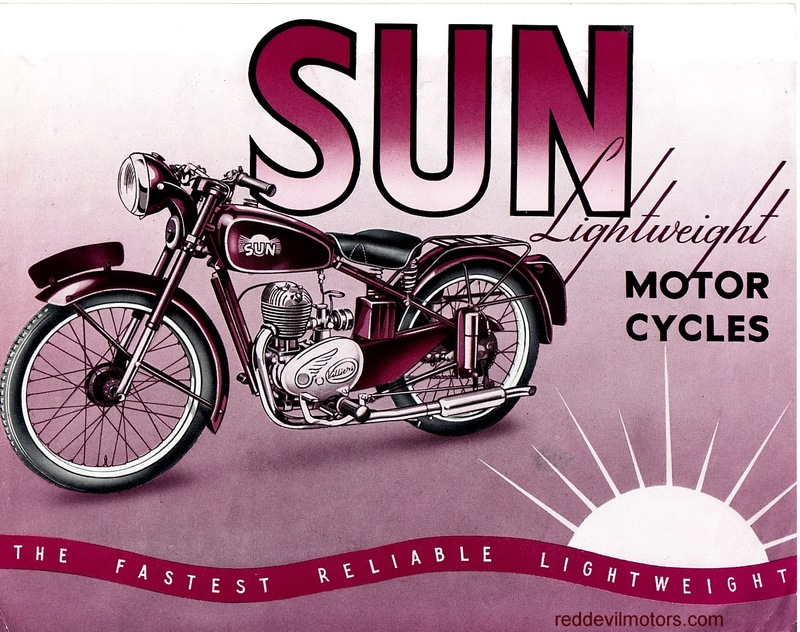 1952 Sun Motorcycles brochure rear cover. The clearout continues and another machine is up for sale. Had a lot of fun with this one, both as a long distance trials machine and in its current west coast 50s style bobber format. Covered in detail elsewhere on the blog, just click on Royal Enfield in the tag 'cloud' on the right hand nav bar. It's up on ebay as a buy it now. Royal Enfield Bullet 350 bobber. From the same source as the Plymouth Monster article, 'Motorcycles in Competition' by Hank Wieand Bowman (1952), this magnificently eccentric home-brewed Harley Hummer tandem twin. http://www.motohistory.net/news2005/news-sept05.html (scroll down to see the article on the Hummer). Wonderfully the Hummer still exists, still works and is in the Wheels Through Time museum in the States. Harley Davidson Hummer home brewed tandem twin. 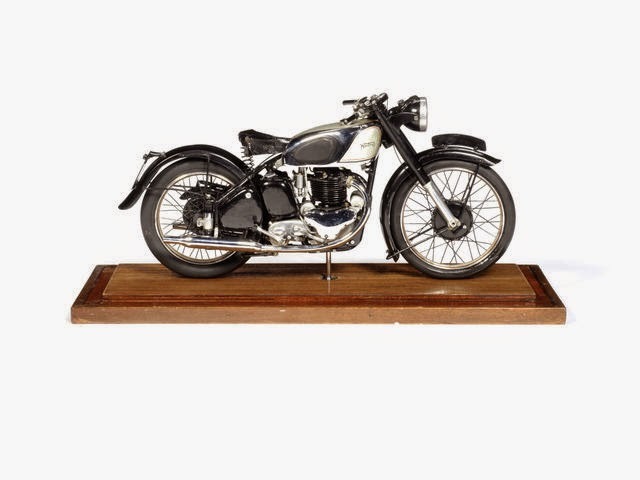 Coming up in the Bonhams Stafford sale this Sunday is this period 1:6 scale model of a Norton Dominator. It's a beautiful thing and would look great on the mantelpiece but what is particularly interesting is that it is likely the twin of the Manx model featured on this blog a while back. 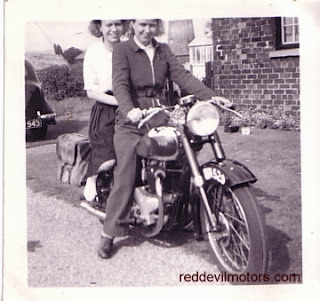 Bonhams have listed the Dominator as having been made by Norton factory staff in 1948. 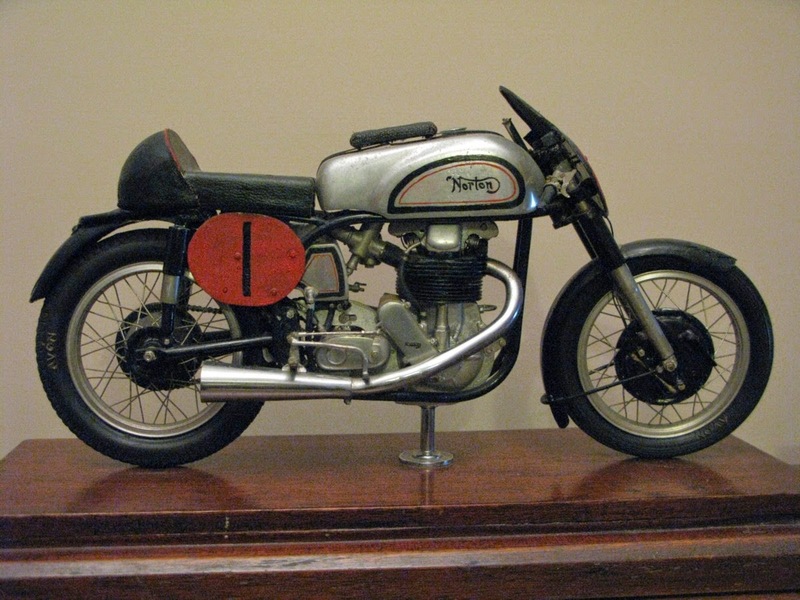 Apparently it was presented to Gilbert Smith, the Norton Managing Director. The Manx model featured on RDM was made by Bert Hooper and presented to Tom Garner. At the time of writing it was known that there was another model made at around the same time and presented to Gilbert Smith. I had assumed that it was another Manx model but putting two and two together it seems that it must have been this Dominator. Putting together another piece of the story it can fairly definitely be surmised that the Dominator was also made by Bert Hooper rather than anonymous 'staff and engineers' as quoted in the Bonhams catalogue. 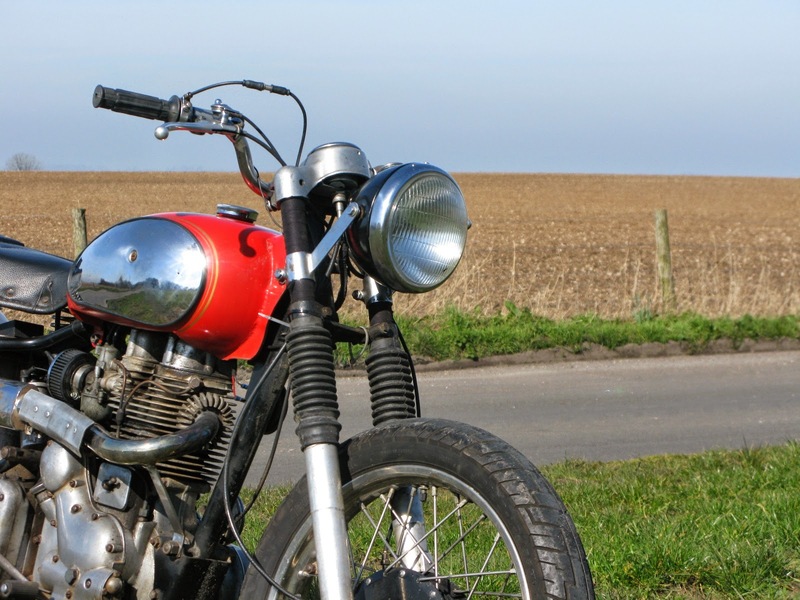 1948 Norton Dominator model offered by Bonhams. Norton Manx model featured previously on this blog. This gem could be yours! 1947 Model G for sale. 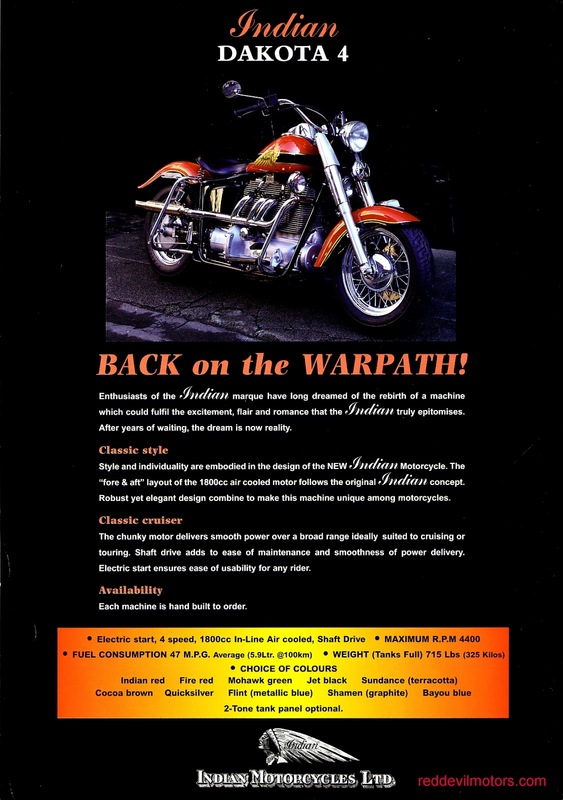 The Indian Dakota 4 was brought to market back in 1999 and that is when this brochure dates from. It is hard to find out if they are still available. I've seen pictures of an updated model and they are built to order so quite possibly if you had deep enough pockets one could be yours. The answer could be to track down the builder, Alan Forbes, at Motolux and give him a call. Alan Forbes had (or possibly still has) the rights to the Indian brand in the UK so you have to assume that a deal has been done with Polaris now that they are marketing new Indian Chiefs in a big way. Over in the States the Dakota has always been sold simply as the 'Dakota 4' rather than as an Indian. Here's the US Dakota 4 site. And follow this link for the UK Indian Dakota 4 pages. Neither site seems to have been updated for a while. Indian Dakota 4 brochure page 1. 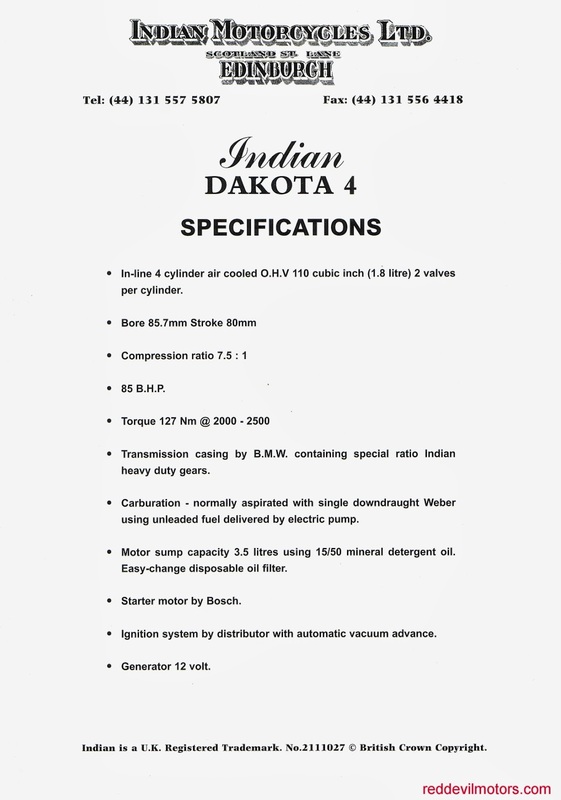 Indian Dakota 4 brochure page 2. Not all rockers rode Gold Stars... Here's a bunch of more typical lads back in the day on regular fifties Brit fare hanging out by a bandstand. 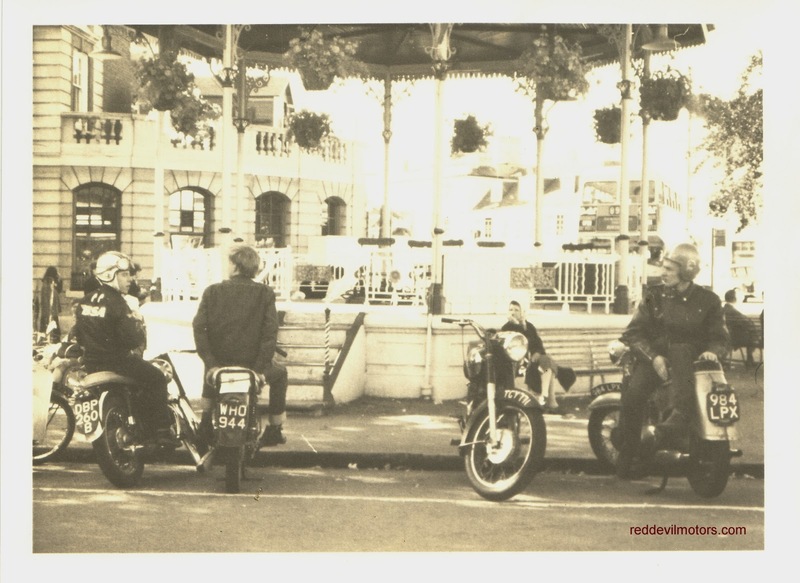 Rockers on a day out. The NSU Supermax is a machine that's firmly on my bucket list of bikes to own for a while and try out. Quirky but functional design, high quality and high performance. What's not to love! This brochure from 1956 is a lovely piece of fifties teutonica. 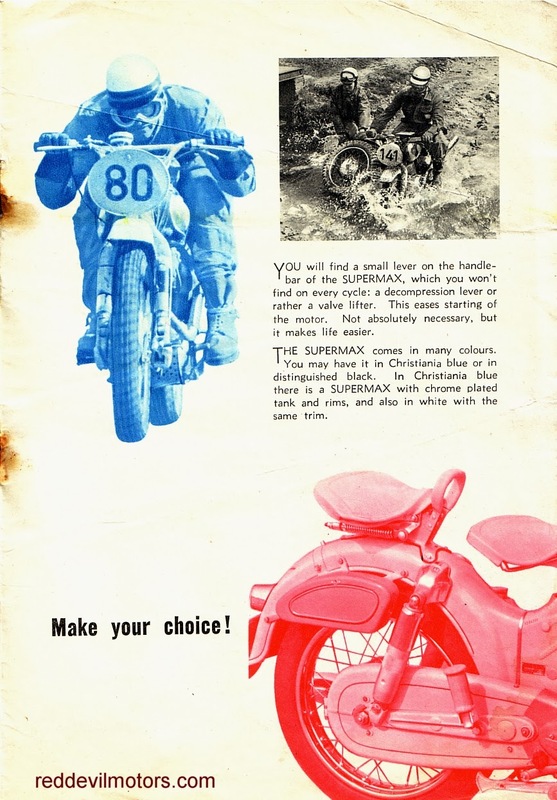 NSU Supermax brochure front cover. 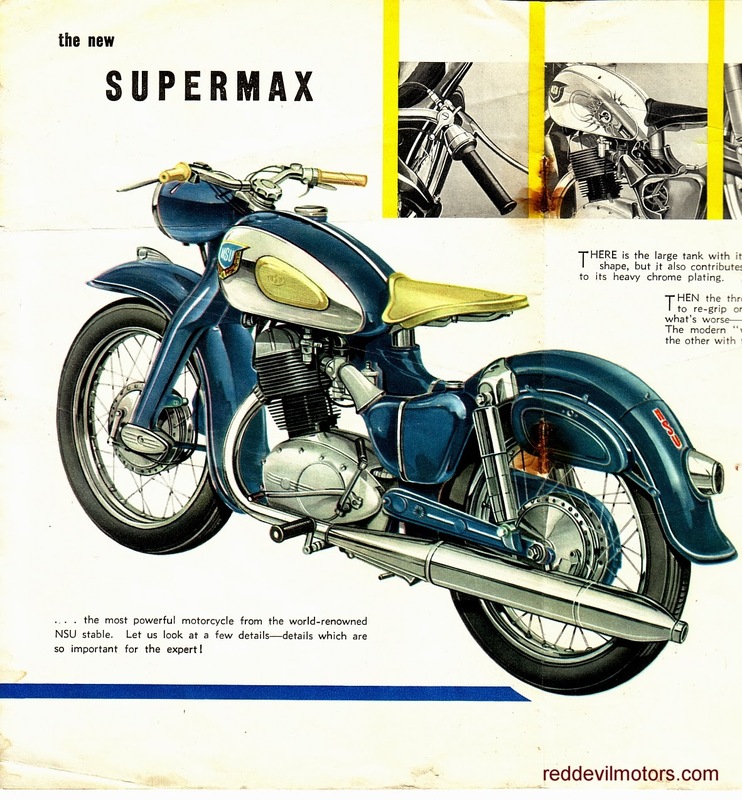 NSU Supermax brochure page 1. 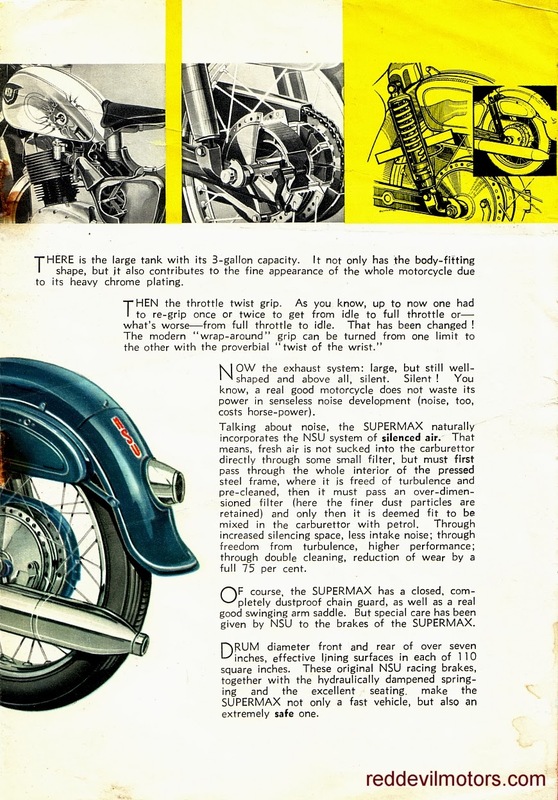 NSU Supermax brochure page 2.
as not to crop the bike). 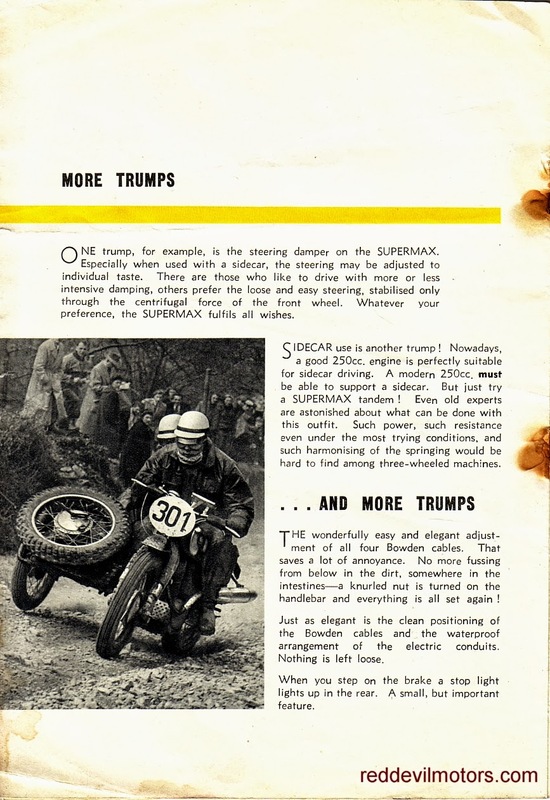 NSU Supermax brochure page 4. 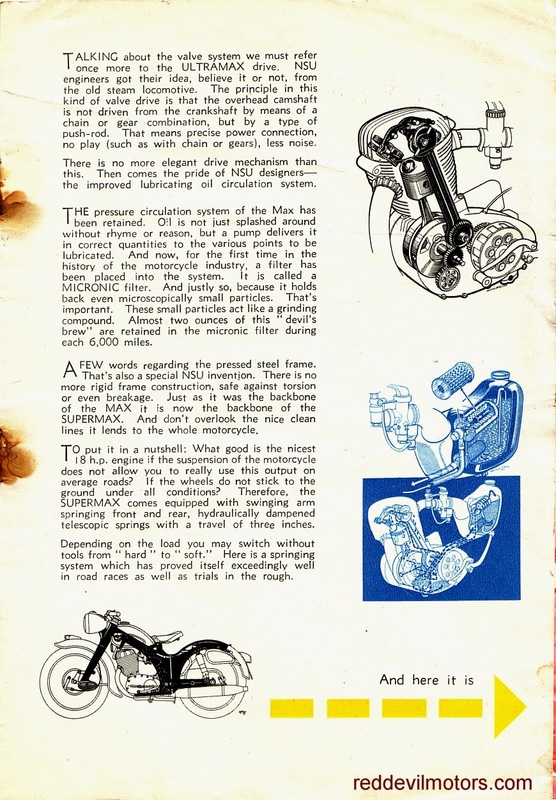 NSU Supermax brochure page 5. 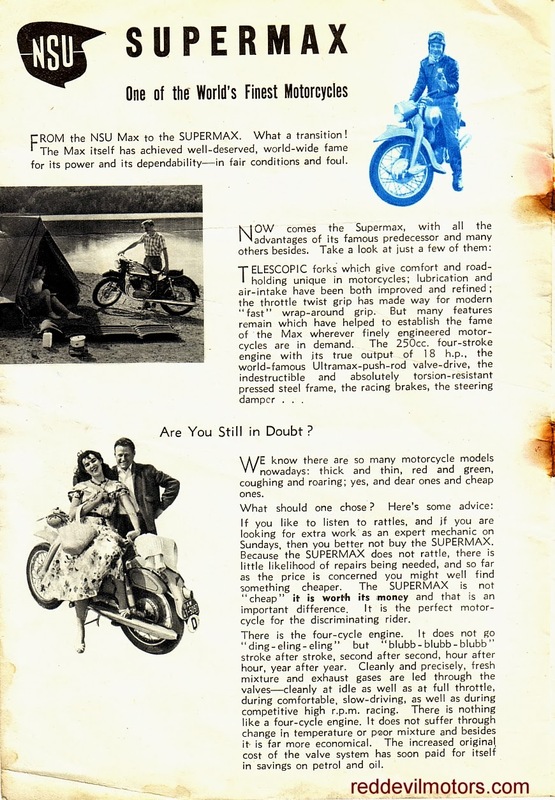 NSU Supermax brochure page 6. 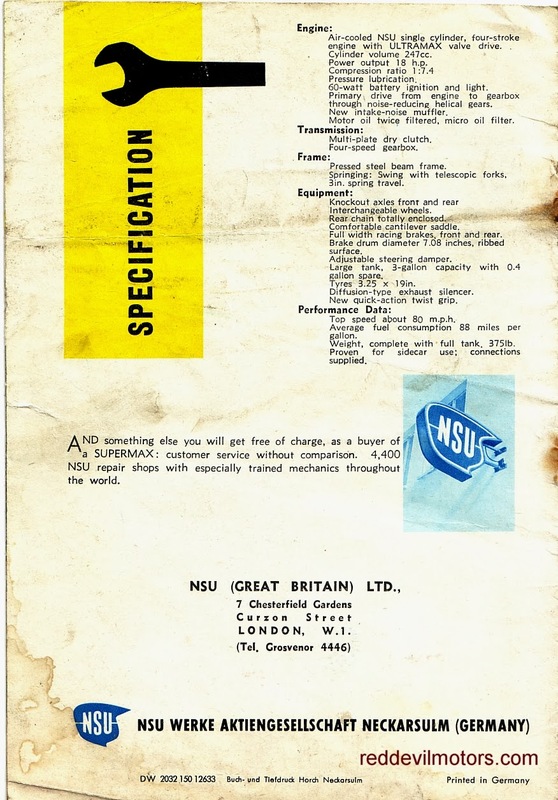 NSU Supermax brochure rear cover. This rare as hens teeth 1919 Briggs and Stratton scooter has just come in to stock at Dutch Lion Motorcycles over in the Netherlands. I've never seen one in the flesh before and it seems that there are only a few left worldwide. The scooter is in beautifully original condition and it would be absolutely criminal for whoever buys it to even consider doing anything more than a mechanical restoration. The Briggs and Stratton Motor Wheel attachment was a development of the British Wall Autowheel. The design was first brought to the States by the A O Smith company and marketed as the Smith Autowheel. 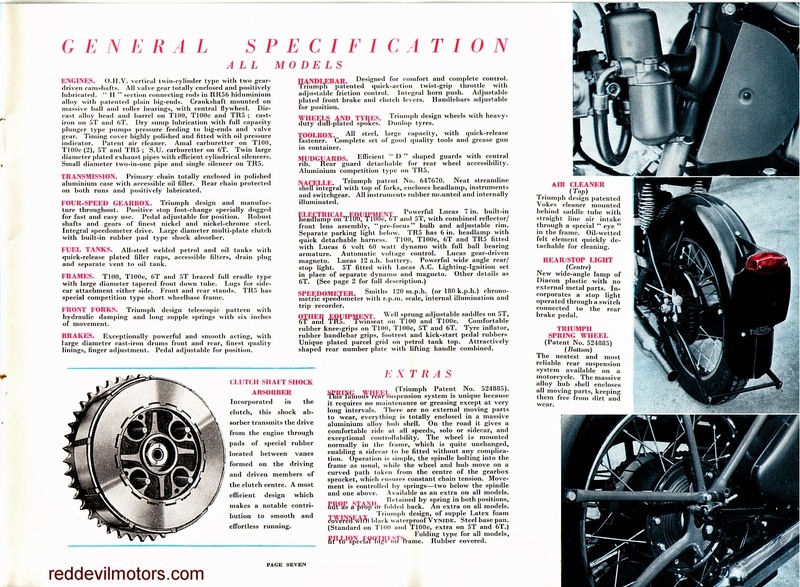 Some improvements were made on the original design including a disc wheel and more importantly doing away with the drive chain by running the wheel directly from the camshaft. 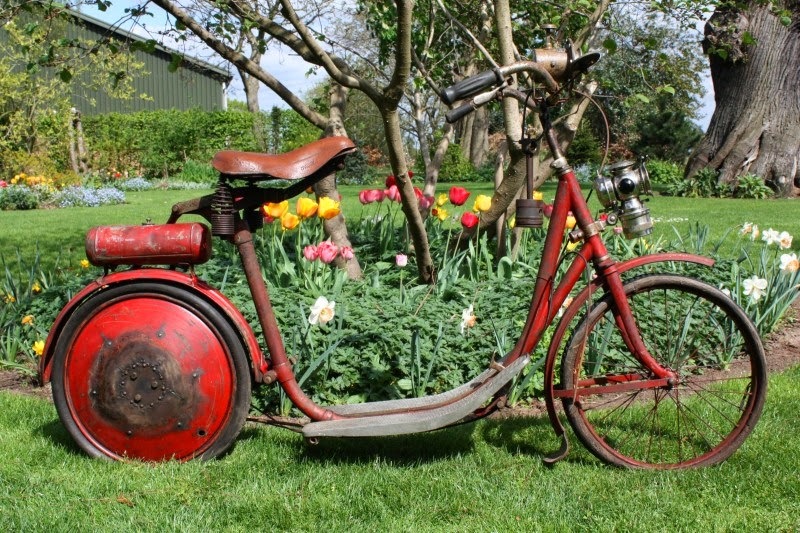 The Smith Motor Wheel ran from 1914 to 1918 and in 1919 the rights to manufacture were sold to Briggs and Stratton. 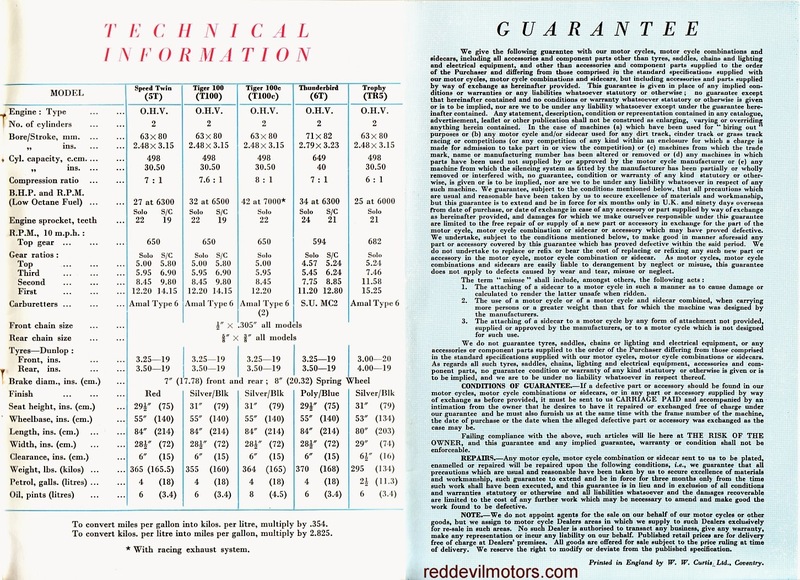 Briggs and Stratton made a couple more changes with a slight raise in capacity and a move over to a flywheel magneto. As with the Wall Autowheel in the UK the American engines were used for an ingenious number of applications, from water pumps through to buckboard four wheelers. It is hard to say if the scooter sold in any numbers, presumably it rode the wave of the post first world war scooter fashion, ie sold strongly for a year or two and then died a quick death. The design concept is very similar to the ABC Scootermotor from Britain. 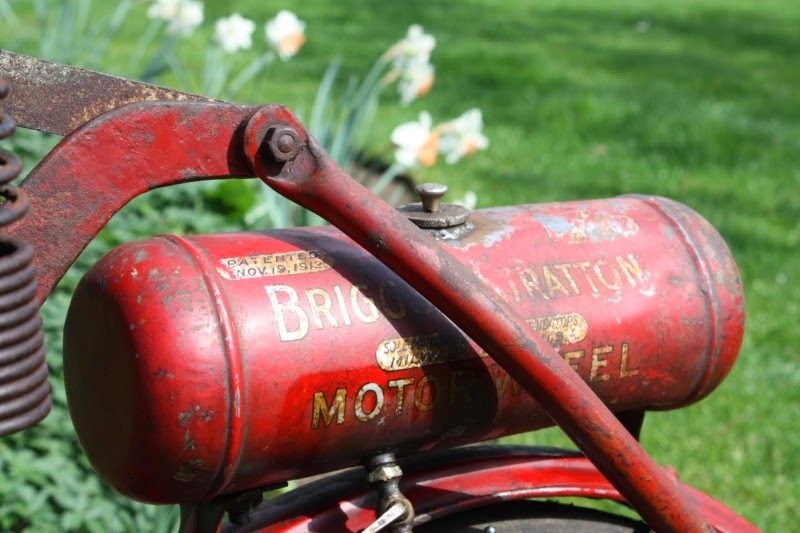 Probably awful to ride but a great display piece, the Briggs and Stratton scooter is likely something that you will not see offered again for a long time. 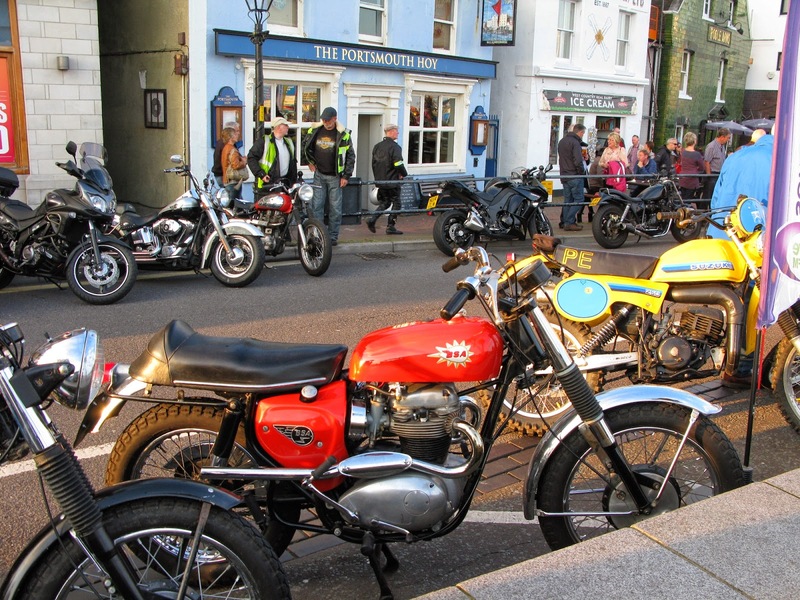 Andrew Pattle's NACC moped archive. The Smithsonian Institution America on the Move exhibition site. 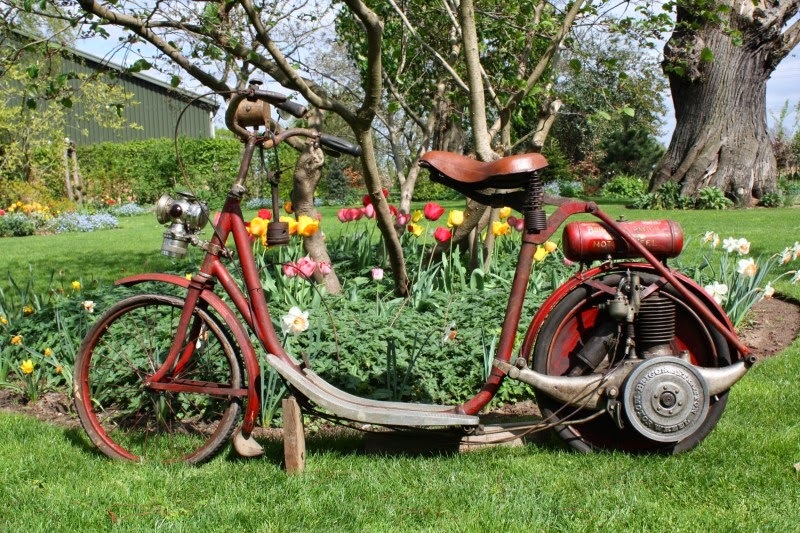 1919 Briggs and Stratton Scooter. Briggs and Stratton scooter petrol tank detail. Briggs and Stratton scooter advert. Elswick Hopper Lincoln Imp - brilliant name! Beginning to look like a proper cycle. Sourcing the parts was the initial hurdle and many a happy hour has been whiled away on ebay. 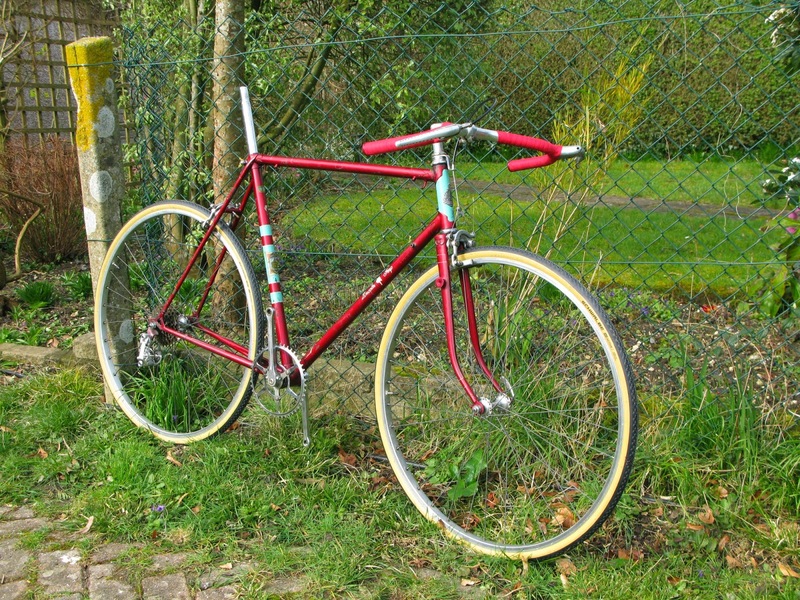 The look I wanted to go for was period sympaphetic rather than period correct and I like my old bikes to look old so nothing requiring refinishing was purchased. Components have been simply cleaned and repaired where required. Mafac brakes seemed like a good idea plus they are slightly unloved and hence not too expensive. The calipers arrived in a small parcel. Hmmm... they seem like two fronts rather than the pair I thought I was buying. I decided to use them anyway though the reach at the rear seems to be slightly short so I may have to rethink. 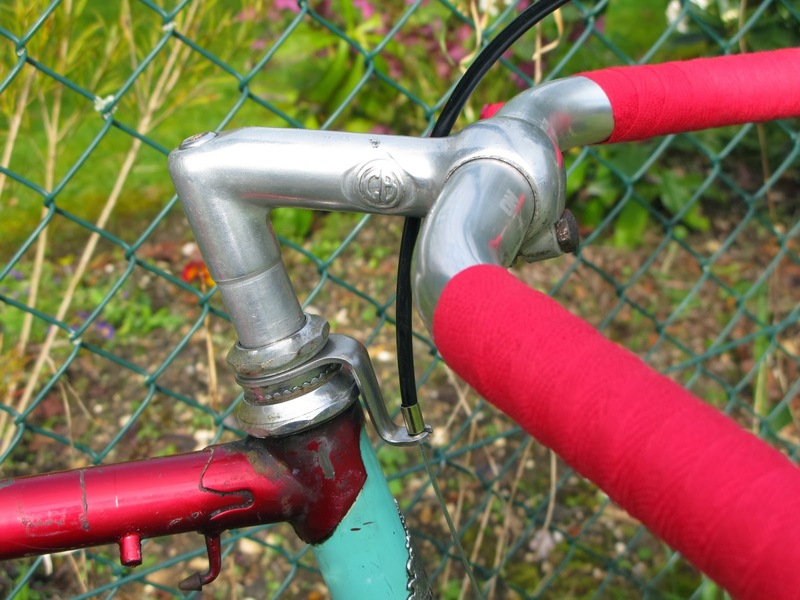 Levers are also Mafac and without hoods look just the ticket. Headset and bottom bracket bearings were seized so came apart, got cleaned and reassembled with new bearings. 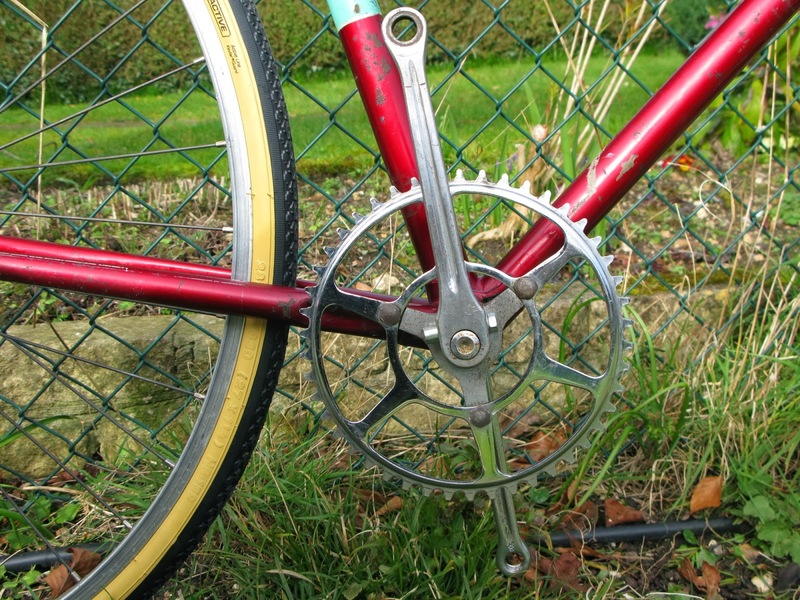 A Williams cottered chainset is ideal. took some effort to fit.. I found a Nuovo Record rear mech cheap (it has a small graze from an encounter with the road). This threw up a minor challenge. 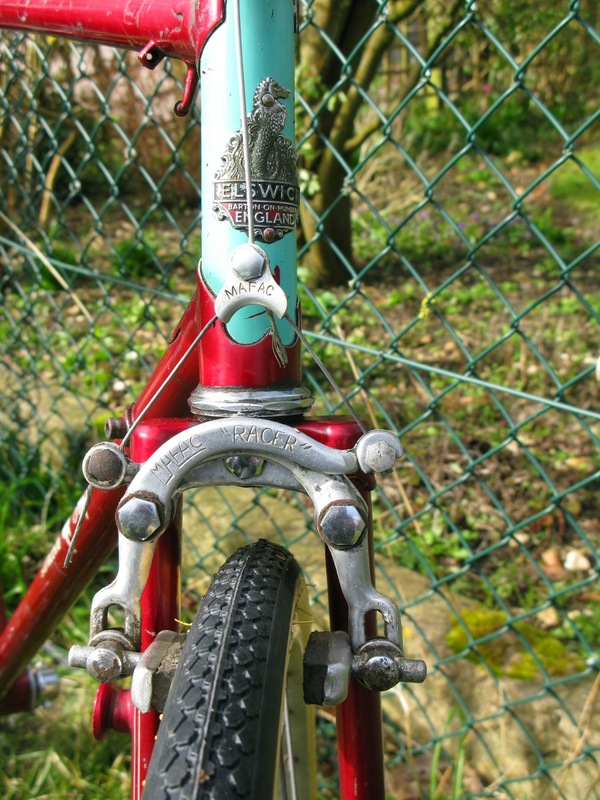 The rear dropouts on the Elswick are Benelux. Now, I had thought that threads for rear mechs were standard. Apparently not. Also the radius from the centre of the mounting bolt to the pivot stop on the Benelux was about three mill greater than on the Campag mech. Rather than give up and use a different mech I decided to cut a metric thread in to the hanger for the Campag mech and took to the mech with a needle file to increase the clearance. In the end it all went together fine but I've ended up with no pivot stop on the mech. I'm fairly confident that it doesn't need one and that the chain tension against the spring of the mech will hold it in the right place. Proof will be in the testing. If it does need a stop a small plate between the hanger and the mech pivot bolt should do the job. I bought a pair of clip on Campag levers assuming that I could take them apart to fit on the braze-on lever mount. Wrong so another one for braze-ons was bought and the aforementioned went in the parts bin. The Benelux system is also different here as there is no flat on the braze-on spigot to act as a stop for the lever friction damper so the flats are going to have to be carefully filed. Mafac drilled levers look the part. 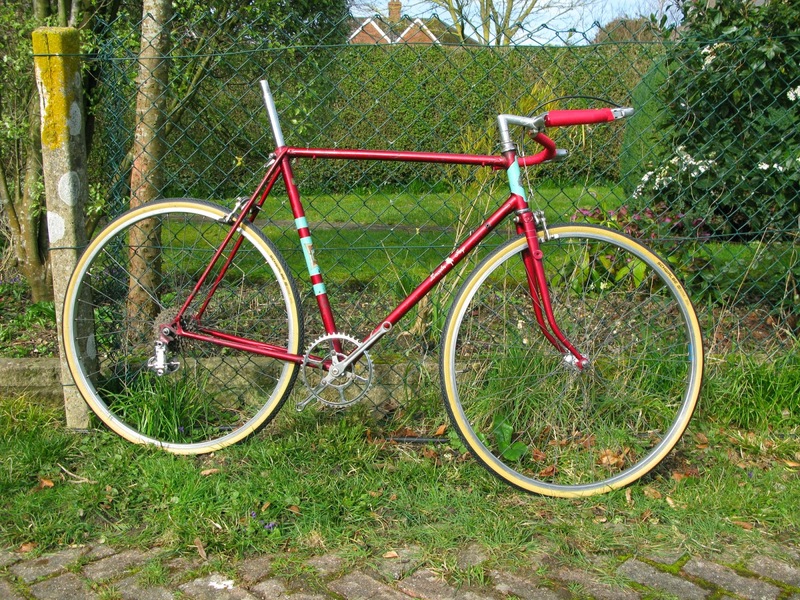 GB stem with On One Mungo moustache bars. The stem is a GB item and bar On One Mungo moustache bars, nice shape, easy on the back and unbeatable on price. Just a saddle, chain and pedals left to source and then iron out any issues with the rear brake and mech. Visually I think it needs mudguards. 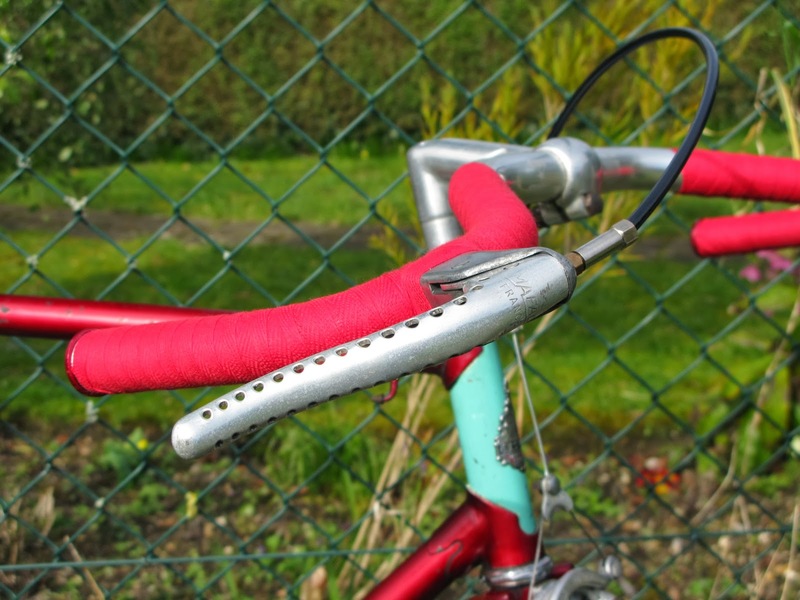 Some original Bluemels in bright red would look nice but I might just go for modern thermoplastic for knockabout durability, after all this one has been built up as a rider rather than a display piece. Came across this gem in Foyles a few weeks back. 350 pages of solid gold for bicycle nerds from author Frank J Berto. 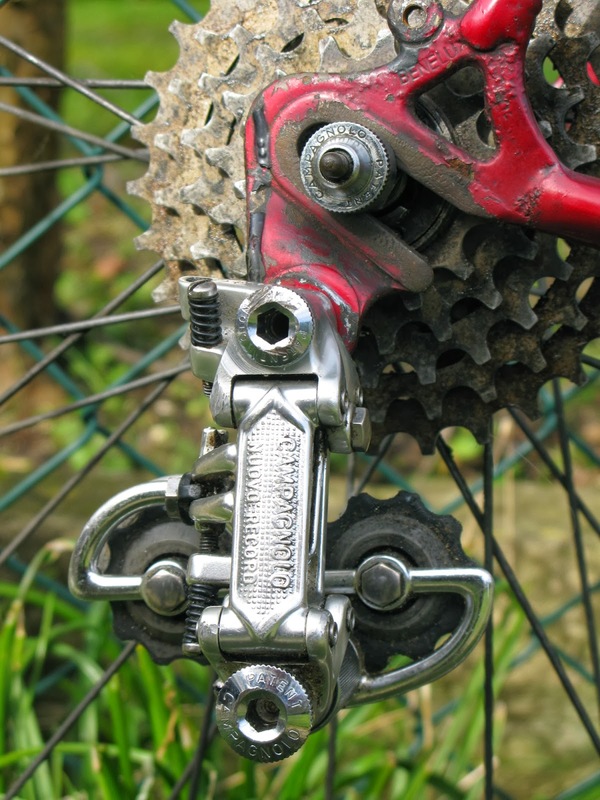 A large format hardback history of the derailleur from the beginnings to present day. Excellently researched, well written and very well illustrated with period pictures and reproduced adverts. Heartily recommended for the more anorak inclined amongst us. A really useful reference for identifying gear mechs. I paid £40, not bad value considering its size, but then found out that it is easily available for £28 from that scourge of the book trade, Amazon. 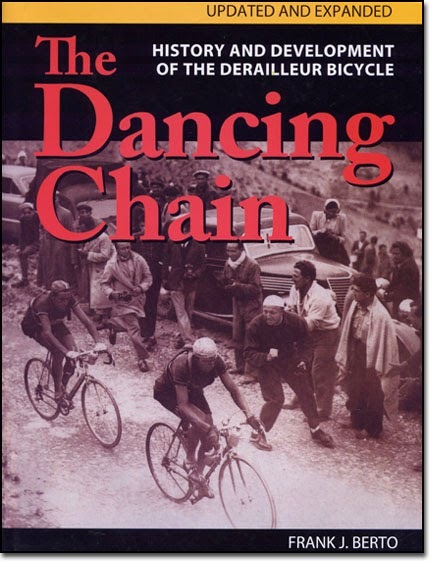 The Dancing Chain front cover. 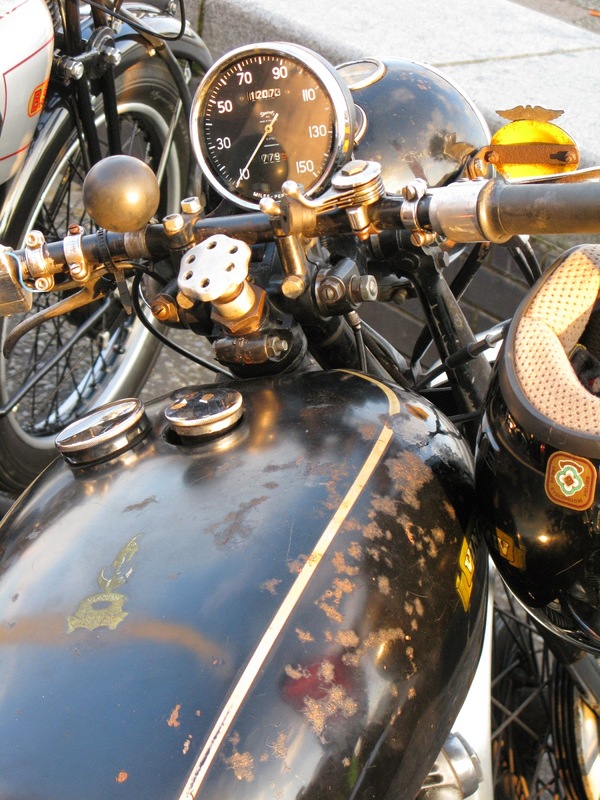 A trio of period snaps of a BSA A7 plunger. If I had to be pinned down on the year I would go for 1949. 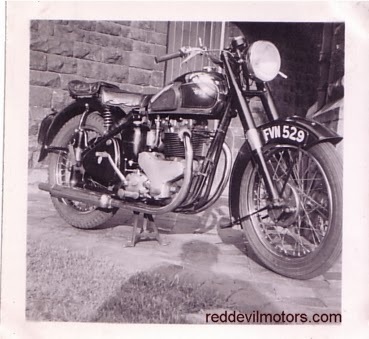 The same BSA A7 decked out for touring. 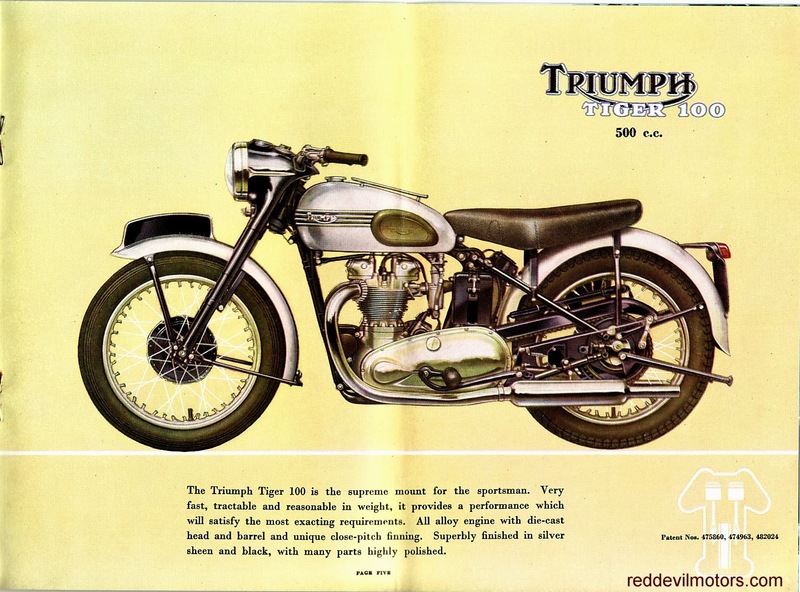 Beautiful Triumph brochure from 1952 when Triumph could make a fairly legitimate claim at being 'The best motorcycle in the world'. 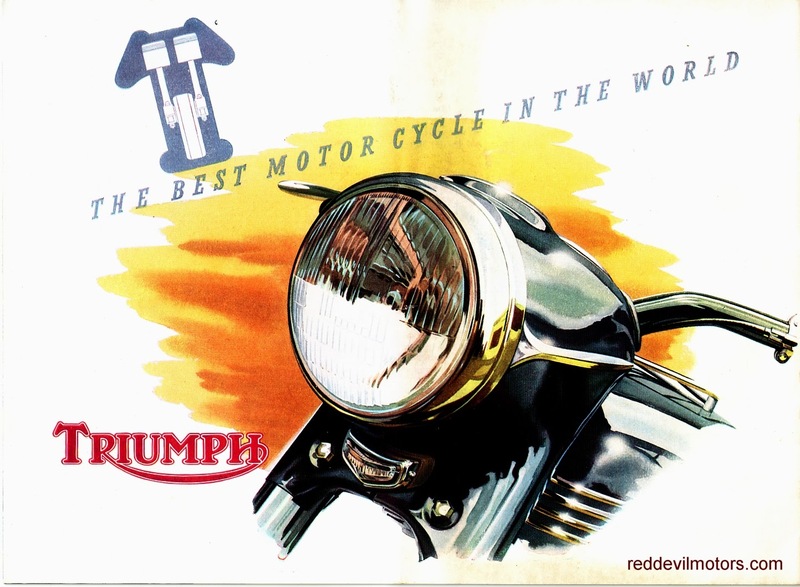 1952 Triumph brochure front cover. crop the picture of the Thunderbird). 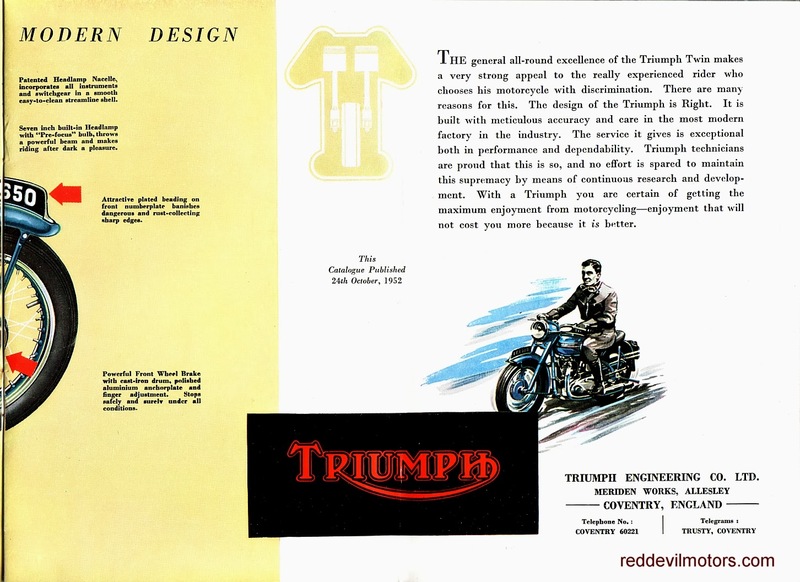 Triumph brochure 1952 page 2. 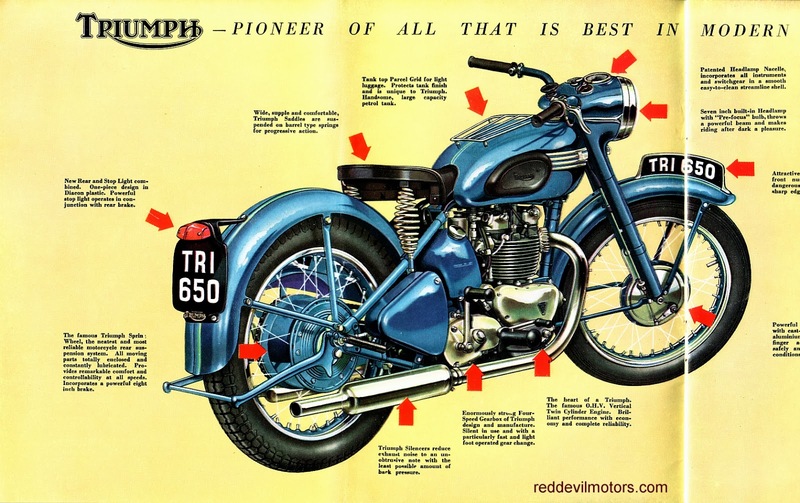 Triumph brochure 1952 page 3. 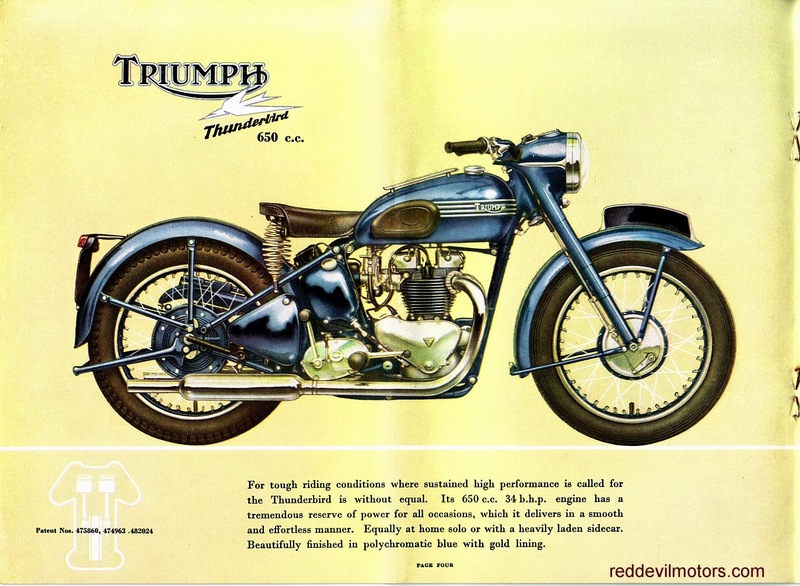 Triumph brochure 1952 page 4. 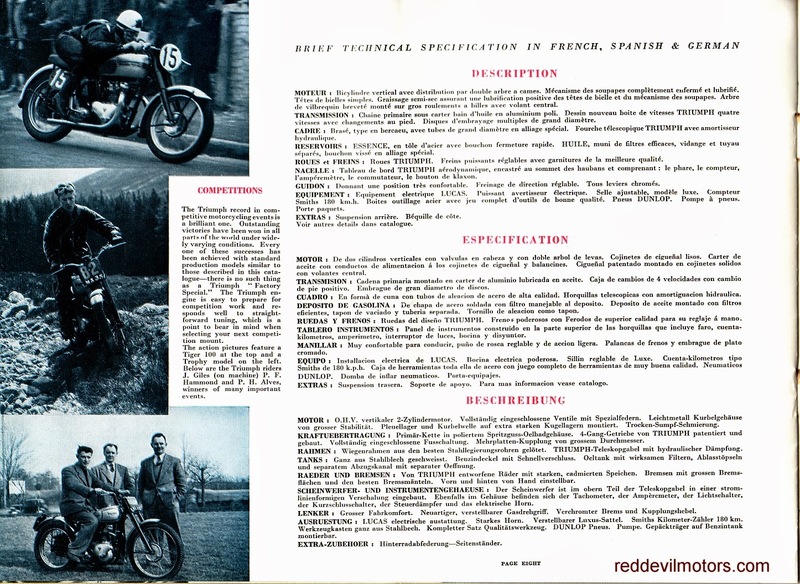 Triumph brochure 1952 page 5. Triumph brochure 1952 page 6. 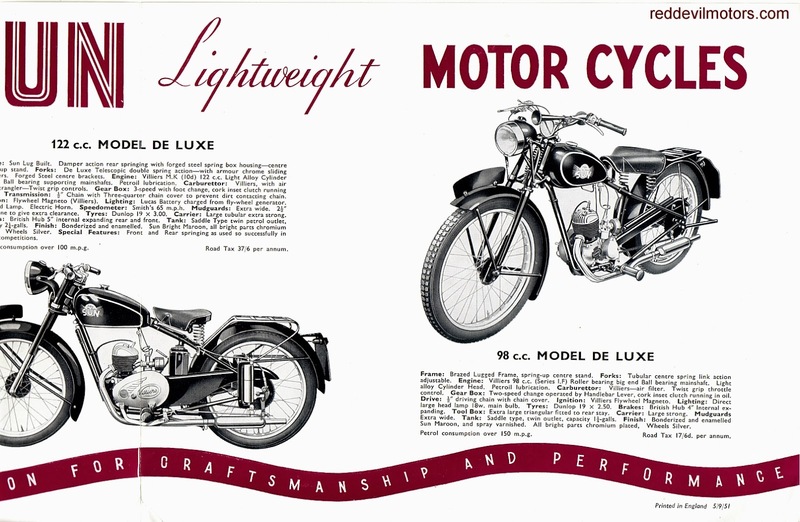 Triumph brochure 1952 page 7. 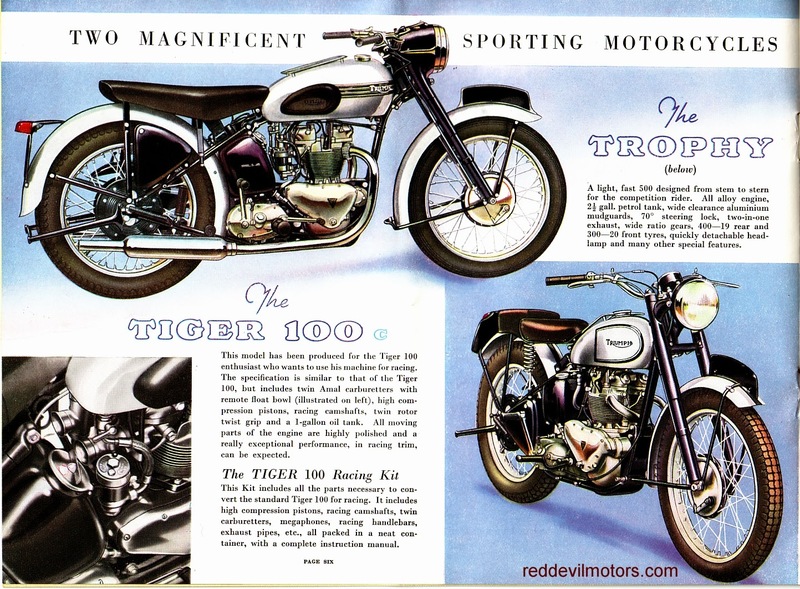 Triumph brochure 1952 page 8. 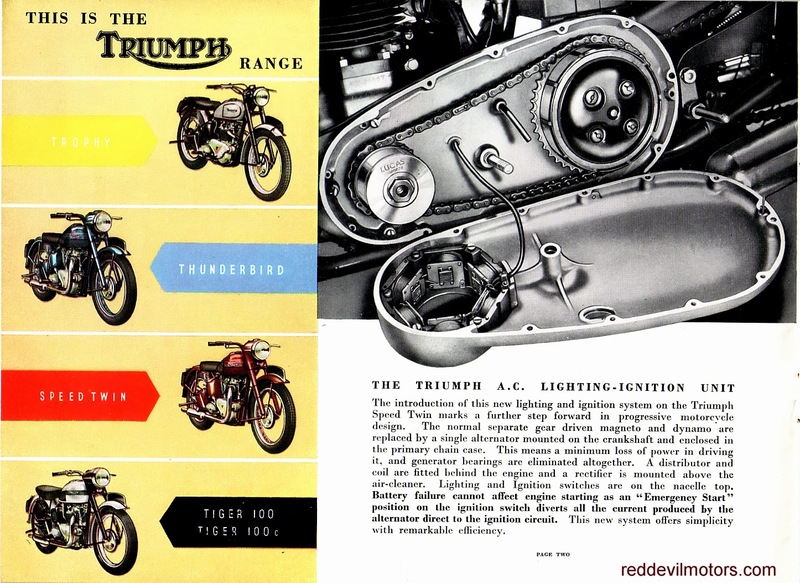 Triumph brochure 1952 page 9. 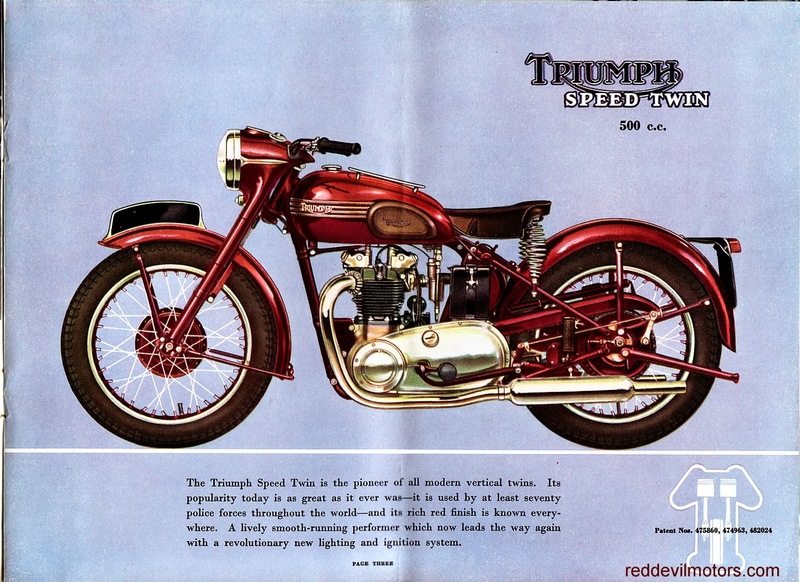 Triumph brochure 1952 page 10. 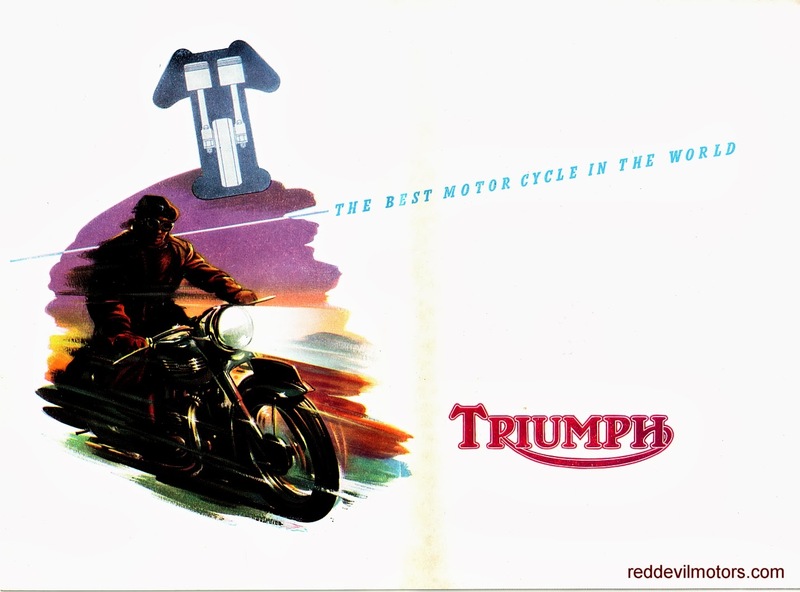 Triumph brochure 1952 rear cover.